Downsizing is always a challenge, but moving a retired couple’s extensive art collection from a single-family home in the Pennsylvania suburbs to a 3,000-square-foot townhouse in Philadelphia presented interior designer Shila Griffith, LEED AP, with a specific puzzle. To accommodate the collection, Griffith looked to the expansive wall that extends from the townhome’s second-floor living area to the third-floor landing. The high ceilings and floating staircase would give her clients a generous space where they could display their art collection. But to avoid damage from nails and screws, Griffith had to be particular about the wall material she specified. “We wanted it to be flexible because they have enough artwork that they might not be able to hang all of it at the same time without it feeling congested,” says Griffith, founder and creative director at SG23 Design, in Palmyra, N.J. The designer settled on cypress plank cladding from ReSawn Timber Co., spaced out and individually installed to create a slatted wall. 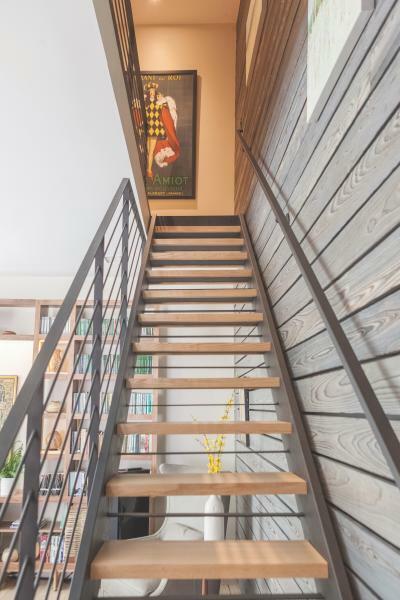 The 1/2-inch gaps, which appear darker due to black paint applied to the underlying wall, allow the homeowners to hang, move, or swap out their two-dimensional art on hooks without drilling holes in the wood. The ReSawn boards also help to tie together the other earthy, wood tones in the space. The outward faces of the cypress planks are treated with the Japanese shou sugi ban method, which chars the wood. The resulting shades of gray and brown simultaneously complement the dark walnut cabinets in the adjacent kitchen and the light wood floors throughout. With its clean lines, abundant natural light, and many objects collected over decades during the clients’ travels, the space is the perfect blend of bright and cozy, modern and traditional. The layout also makes use of wood furniture crafted by the husband’s firm, Combray Furniture Studio. 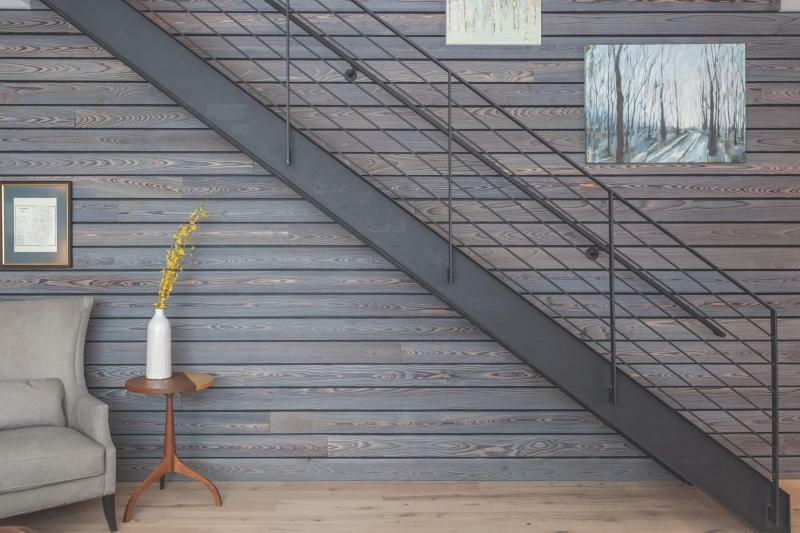 Cypress ReSawn planks give the clients a place to hang art while also tying together the room’s color scheme. DESIGNER / SG23 Design, Palmyra, N.J. MANUFACTURER / ReSawn Timber Co.
Bugs and mice can live in there!